When we hear the word canvas, it takes us to the world of “styling joyfully”. 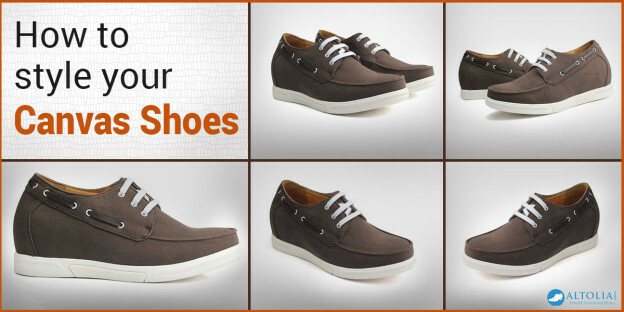 However, it is little tricky to style your canvas shoes with outfit perfectly. Well we have done the homework for you; here is your short style guide to pull off canvas shoes perfectly. Shorts: Canvas shoes blend perfectly with your shorts, but prefer wearing a fancy canvas with your shorts. Reason being your shorts are till your knee length and below, the only fashion you can flaunt is by wearing a fancy shoe - try playing with colors! The famous ones are brown canvas shoes, red canvas, black canvas and we can't forget classy white ones. Try not to wear open floaters with your shorts. Chinos: they are hot in fashion from the time they have hit the fashion market. Although you can style any pair with your chinos but canvas shoes add a semi-formal/casual look to your attire. You can cuff down your chinos or fold them to reach your ankles. You will be an attention seeker if you do this. Denims: canvas and denim are meant to be dressed together. Nothing brings out the color of your denims like chinos. Get your canvas dyed in the shade of blue to dazzle your look. Desert canvas, slip-ons, ankle canvas will go with your denims. But if you are a fan of styling ankle laced canvas, make sure to tuck your denims in your shoes for a catchy look. A Final Word: apart from these you can even try to style yourself with the variety of canvas like Oxford, buckled, etc. You can't afford to go wrong with them. Try them at your workplace, for parties, on the beach or anywhere you like chilling around.